Around 1.5 million Syrians have fled to neighboring Lebanon to escape the war. Almost half are children, who are particularly prone to suffering from the effects of war. These also include children who have lost their hearing. The non-profit Hear the World Foundation is helping these children to hear again, with its HearLebanon project. This gives the children the opportunity to learn to talk, so they have an equal chance of being able to live independent lives later on. As a little girl, Isra suffered when the bombs were exploding in her home city of Aleppo. When she came down with a heavy fever and her hearing became worse and worse, her family could not find any doctor in the war zone who could help Isra. The infection led to severe hearing loss – she was in urgent need of a hearing aid. As a result, Isra (who is now seven years old) never learned to talk and was unable to attend school. Isra’s fate is similar to that of many children who have lost their hearing because of the war. Some suffer from trauma and hearing damage caused by explosions. However, untreated inflammations or inadequate hygiene resulting from poor medical care can also cause hearing loss, which has particularly serious consequences for children: because those who cannot hear cannot learn to talk either. Isra is one of 100 children in Lebanon, for whom the Hear the World Foundation, together with its local partner Houri Hearing, has provided state-of-the-art hearing technology since November 2017. Isra’s family fled Aleppo in 2013 and she now lives under poor conditions in Southern Lebanon. At the end of last year, the girl went to Beirut with her parents, full of hope for a better life. This is because experts from hearing-aid specialist Sonova travelled to Beirut at the start of November as volunteer assistants for the Hear the World Foundation’s HearLebanon program, in order to help children like Isra hear again, or hear for the first time. First, they conducted hearing tests and took ear impressions, from which Houri Hearing made earmolds for each individual child. Three weeks later, the big moment arrived: each of the 80 Syrian and 20 Lebanese children received a modern, individually fitted hearing aid. With their hearing aids, the children now have the necessary technical equipment with which to learn to talk and to attend school. However, what if a hearing aid malfunctions or the batteries run out? The Hear the World Foundation and its local project partner Houri Hearing guarantee professional subsequent care, so the children can visit one of Houri Hearing’s five branches at any time to get their hearing aids checked and adjusted if necessary, and to pick up replacement batteries. This is essential, if the children are to be helped on the long term. 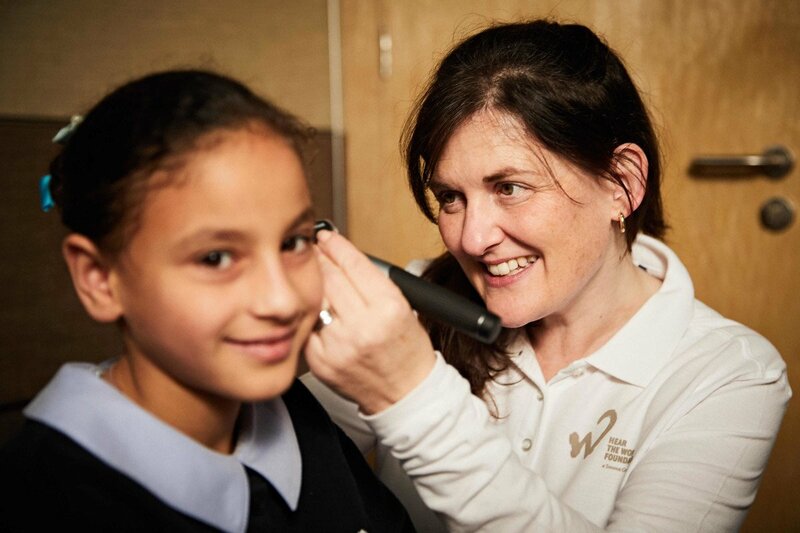 Sonova volunteer Anna Biggins fitting hearing aids. The Syrian refugee child, Chahama can hear with her donated hearing aids. Sonova Voluteer Nazan is conducting hearing screenings. A group of refugee children with their parents and the Hear the World team.